Every year Christians across the world gather in prayer for growth in unity. We do this in a world where corruption, greed and injustice bring about inequality and division. Ours is a united prayer in a fractured world: this is powerful. However, as individual Christians and communities, we are often complicit with injustice, and yet we are called together to form a united witness for justice and to be a means of Christ’s healing grace for the brokenness of the world. 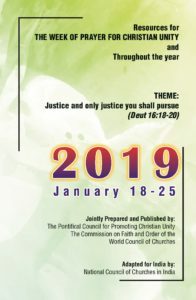 The theme for the 2019 Week of Prayer for Christian Unity, “Justice and only justice you shall pursue” is taken from the book of Deuteronomy 16:18-20. The Week of Prayer for Christian Unity 2019 has been prepared by Christians from Indonesia. With a population of 265 million, 86% of whom are reckoned to be Muslim, Indonesia is well known as having the largest Muslim population of any country. However, about 10% of Indonesians are Christian from various traditions. In terms of both population and the vast extension of the country Indonesia is the biggest nation in South East Asia. It has more than 17,000 islands, 1,340 different ethnic groups and over 740 local languages and yet is united in its plurality by one national language Bahasa Indonesia. The articulations on the prayer themes have however been adapted to the Indian context by the NCCI Secretariat. Churches all over the globe are called to work together to heal the wounds in the body of Christ. At the same time, need to discern God’s hand at work in bringing about reform, healing and liberation. In other words, churches should be together and work where God is. The installation of Rev. Asir Ebenezer as the new the General Secretary took place on 3 January 2019. The program began with a worship service in which the Office bearers of NCCI, members of Working Committee, Finance Committee, Executive Secretaries and Staff were present. The President handed over a copy of The Holy Bible and Constitution of NCCI to the new General Secretary. Rev. Dr. Roger Gaikwad the outgoing General Secretary handed over the charge. Rev. 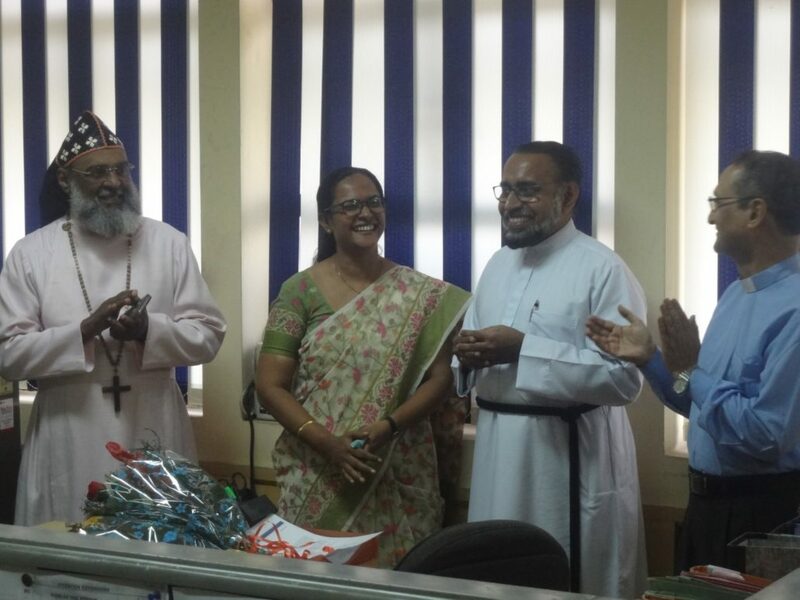 Asir Ebenezer was felicitated by the Church dignitaries who graced the occasion. After the installation service Rev. Asir Ebenezer was led to the General Secretary’s room where he was seated in the general secretary’s chair. Rt. Rev. 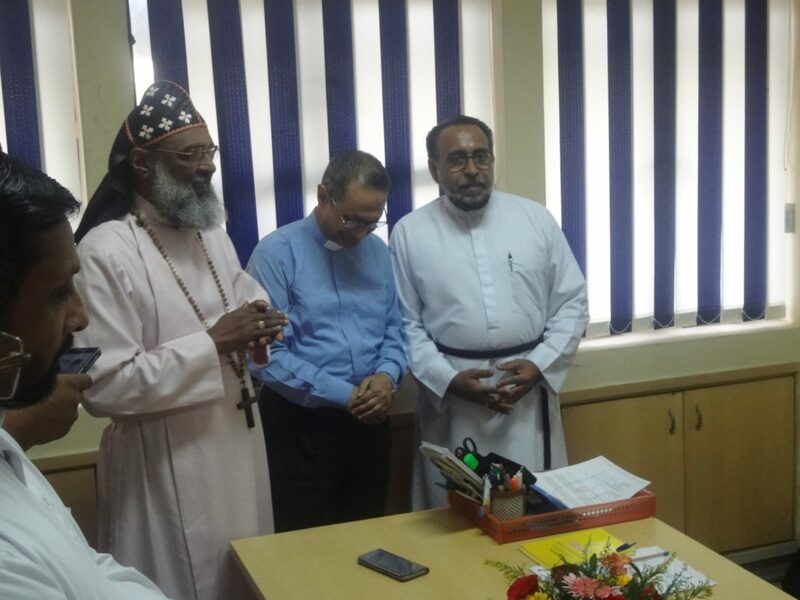 Dr. J. George Stephen, Bishop of Madras Diocese consecrated him in prayer . Rev. 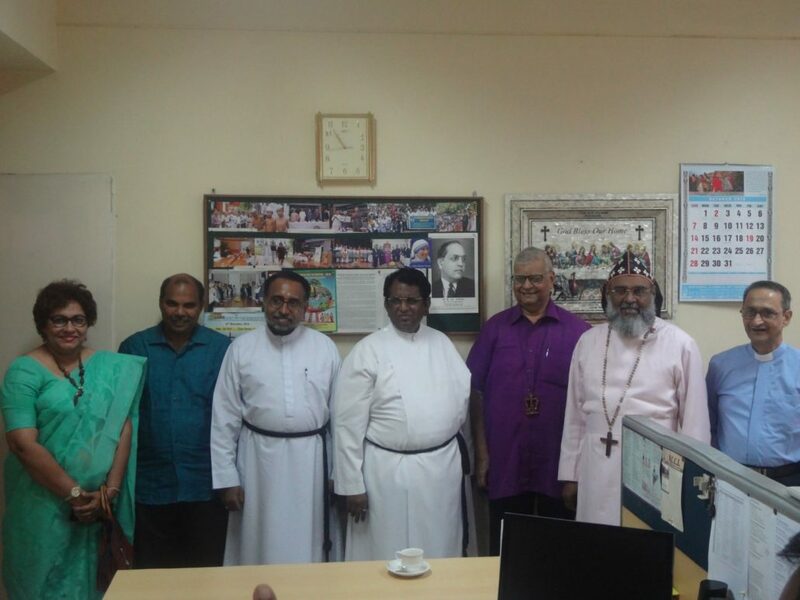 Asir Ebenezer is an ordained minister of the Church of South India (CSI). He has been in ministry since 1992 and has served in various positions in national and global ecumenical forums. Prior to this, he was serving as Director of Social Empowerment: Vision in Action (CSI_SEVA) at the CSI Synod. He had earlier served the NCCI in various positions, including Officiating General Secretary of NCCI in betweeb 2004 and 2010. A well-known figure in ecumenical circles, theologian, community-enabler and finance expert, the multiple competencies of Rev. Asir Ebenezer will go a long way to strengthen the council. 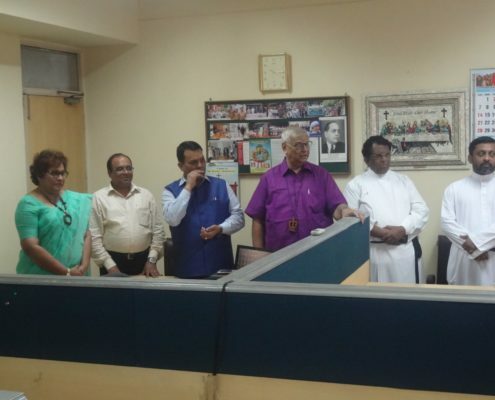 The office Bearers, Secretaries, and the Staff of the NCCI welcome Rev. Asir Ebenezer and wish him well in his new responsibility. The Rev. 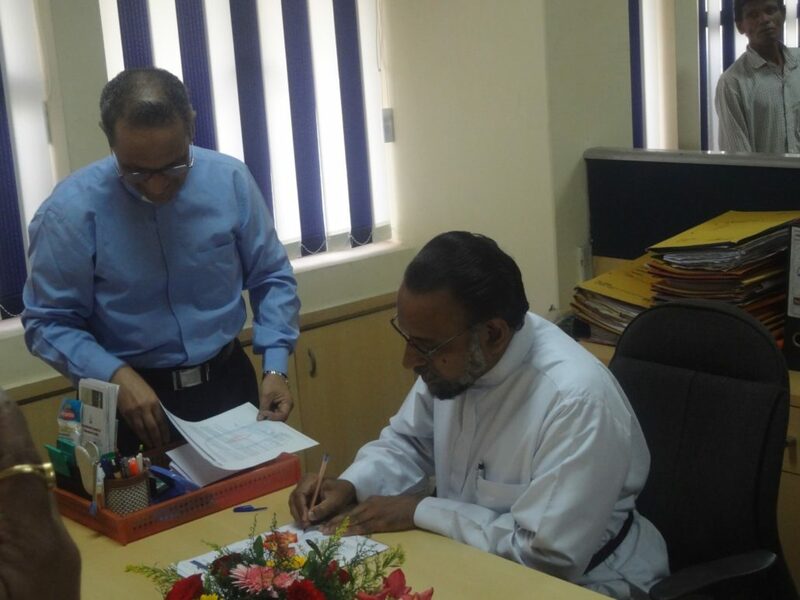 Dr. Roger Gaikwad moves to another area of work relating to Theological Education. The NCCI acknowledges his contribution to NCCI and wishes him well for his new endeavor. Good Evening!! Christmas is on the verge. What is Christmas?Is it yet another festive of celebration? Certainly not. It is an emotion. It is a harvest of memory of God acknowledging God’s humanity and humans realizing their divinity. Christmas is when Christ – the Creativity of God – took flesh in Jesus. So come let us try to comprehend the incomprehensible mystery of Incarnation. Moral: Christmas seems to have lost its anamnesis. The paraphernalia commemorating its memories are at sale but too expensive for the commons. Market has usurped the manger. In the pomp and gaiety of the celebrations of Christmas we often push Christ to the periphery and thus our Christmas turns out to be a Christ – less Christmas. Narrator:Who is this Christ Jesus secluded on the fringe? Shall we take a re-look at his birth. One fine day, off-the-wall, trees blossomed, birds chirped like never before, wind blew bearing the aroma of flowers, the sky poured out his love through the clouds and the earth drenched in it, spread her fragrance all throughout. The entire cosmos stood in awe on seeing its Creator, Creativity and Animator. Jesus, him we call. The True Human. We re-imagine the birth of Jesus on the Streets. Mary: May Peace be upon all of you as we welcome you to celebrate the birth of our child Jesus the Christ. We are the children of the street, we bear the stench of exclusion, our clothes are tattered and stained, we have nothing to offer than our sweat and blood, yet God chose to incarnate on the streets among us. Today the streets are blessed.The womb of a woman has become the site of inception of the Salvation of the World. Mary: It’s time to celebrate. Come let’s sing and dance for the Savior is born today. Rev. 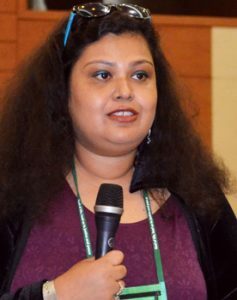 Moumita Biswas served as Executive Secretary, NCCI Women Concerns from September 2014 to August 2018. She was ordained as a Presbyter in North East India Diocese of the Church of North India on September 2, 2018. Hence she has started serving the Diocese since September 2018. We thank Rev. Moumita Biswas for the services she has rendered to the NCCI during the past 4 Years. We wish her all the best in her new ministry. Rev. Caesar David served as Executive Secretary, NCCI Communications from March 2013 to October 2018. An ordained Methodist minister, he is now moving on to serve the Methodist Church in USA in the State of Iowa. He will be taking up his new assignment as a pastor in the church from December 2018. The NCCI is grateful to Rev. Caesar David for his services to the NCCI during the past 5 years and 7 months. We wish him all the best in his future ministry. Rev. 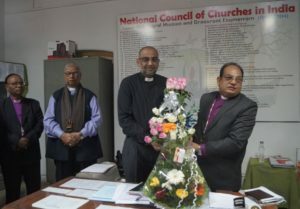 Dr. Abraham Mathew was installed as the next Executive Secretary of NCCI Policy, Governance and Public Witness at NCCI’s Office in New Delhi on October 1, 2018. Rev. Dr. Mathew belongs to the Malankara Mar Thoma Syrian Church, has a Ph.D from Trinity College, Bristol, and has worked extensively in Churches, seminaries and the mission field. Having had several responsibilities in various forums, having published several books and articles, and having represented the Church in important national and international events, his vast experience is expected to greatly benefit the council and its wide ministry. After the installation, Rt. Rev. Gregorios Mar Stephanos Episcopa dedicated Rev. Dr. Mathew in prayer. 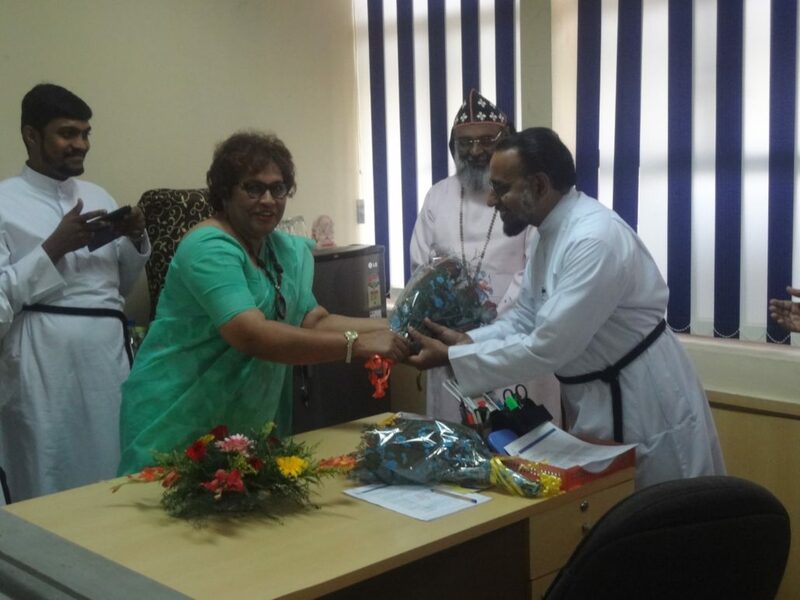 Mrs. Aleyamma Thomas, Vice-President of NCCI, felicitated the new Executive Secretary on behalf of the NCCI and the Malankara Mar Thoma Syrian Church. Important Church dignitaries including Rt. Rev. 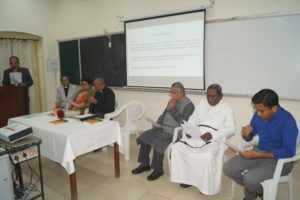 Collin C. Theodore (Secretary of North West India Council of Churches), Mr. Alwan Masih (General Secretary of Church of North India), Mrs. Lidwina Cedric (Director of Ecumenical Church Loan Fund India), Dr. Mary Verghese (Executive Director of The Leprosy Mission), Mr. Samuel Jayakumar (Former Executive Secretary of NCCI Policy, Governance and Public Witness) and Prof. T. K. Oomen (Professor Emeritus at Jawaharlal Nehru University), along with Clergymen, other Church leaders and NCCI Delhi office staff, graced the occasion and wished the ministry of Mrs. and Rev. Dr. Abraham Mathew to be blessed with success and good fruit. Intern, NCCI Policy, Governance and Public Witness. The biggest challenge that young people living below poverty line (BPL) face in their day to day life is the difficulty of accessing employment opportunities. Though some of them are educated, they fail to get jobs due to lack of many necessary skills. One such necessary skill is digital skills, which are needed in this era of computer assisted applications. To address this concern, Rev. 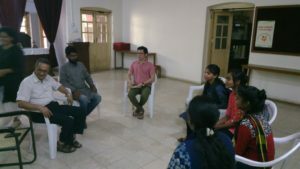 Caesar David, Executive Secretary – National Council of Churches in India Communications (NCCI-Com) and Mr. Jianthaolung Gonmei, Executive Secretary- Youth Concerns (NCCI-YC) started a Digital Literacy Modular Course of three months for Capacity Enhancement of disadvantaged youth. The aim of this project was to provide the benefits of computer based education and skills training to students from socially and economically backward areas of Nagpur city, and to equip them for work with computers thereby being able to do better in their life. The pilot project which started with 5 students on January 28, 2018 and which concluded on April 30, 2018 was conducted in the NCCI premises at Nagpur. All the students were from economically weak backgrounds, living in slum localities. A post-graduate degree or its equivalent in Political Science or Economics or Sociology or Law or any related subjects. Skilful in relating with government, churches and civil society. Excellent knowledge of MS Office, social media and apps. The candidates should be between 40 and 55 years of age. The upper limit of age criterion will be relaxed in the case of any Christian high level Government officer. Any other related work that may be assigned from time to time. Location: The Executive Secretary – Policy Governance and Public Witness will operate from Delhi. Applicants should also provide their telephone/cell phone contact nos. Candidates, who have applied earlier, need not apply again. Short listed candidates will be called for an interview. Selected applicant will be expected to join soon after the selection is made in June 2018. Call for applications to the post of NCCI Executive Secretary – Policy, Governance and Public Witness. Kindly download a copy of the advertisement of the NCCI calling for applications to the post of NCCI Executive Secretary – Policy Governance and Public Witness. Please encourage suitable candidates to apply for the same. https://ncci1914.com/wp-content/uploads/2018/03/VACANCYCOP2018.jpg 126 370 Caesar David http://ncci1914.com/wp-content/uploads/2018/05/NCCILOGO105-300x72.png Caesar David2018-03-05 13:29:462018-03-05 15:29:08Call for applications to the post of NCCI Executive Secretary – Policy, Governance and Public Witness. Sub: Urgent Appeal not to give assent to the Land Acquisition, Rehabilitation and Resettlement Amendment Bill 2017 and the Jharkhand Religious Freedom Bill 2017 of Jharkhand Government. 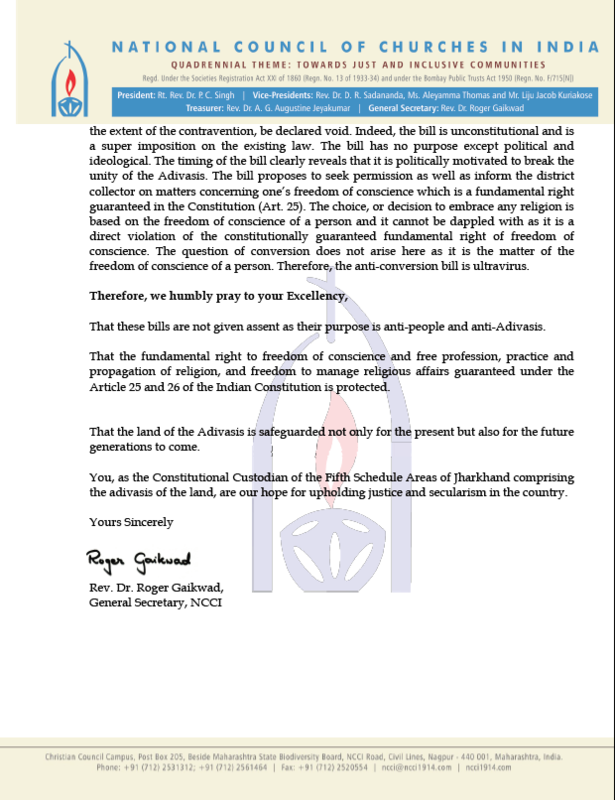 The National Council of Churches in India, which represents around 14 million members of the Protestant and Orthodox Church Traditions in India, and which includes significant numbers of dalits and tribals/adivasis present the following urgent appeal to you. This is regarding Land Acquisition, Rehabilitation and Resettlement Amendment Bill 2017 and the Jharkhand Religious Freedom Bill 2017 of Jharkhand Government. As you are already aware, the State of Jharkhand was created for the Adivasis and has Fifth Schedule Areas of which the President is the direct Constitutional custodian. Along with the adivasis of Jharkhand the NCCI is very much concerned by the situation in the State in the recent days. We have total trust and confidence in your Excellency’s disposition towards the concerns of the State. 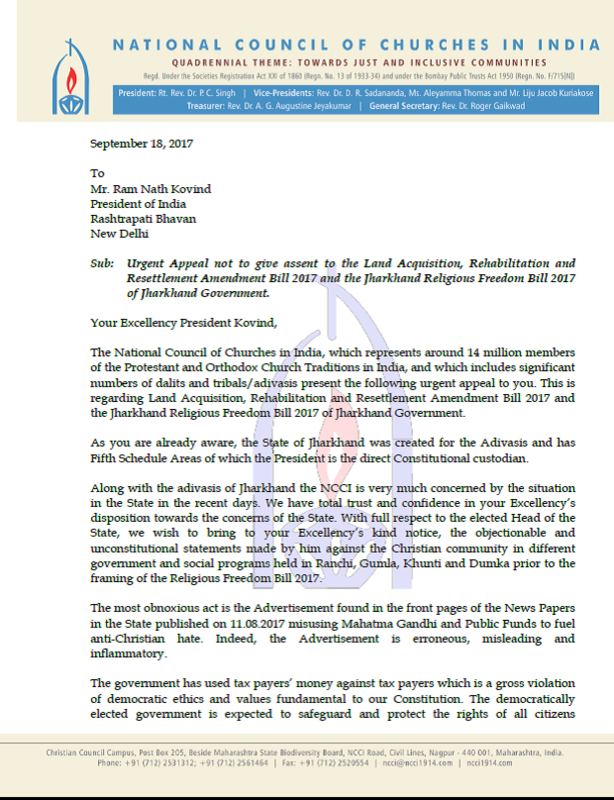 With full respect to the elected Head of the State, we wish to bring to your Excellency’s kind notice, the objectionable and unconstitutional statements made by him against the Christian community in different government and social programs held in Ranchi, Gumla, Khunti and Dumka prior to the framing of the Religious Freedom Bill 2017. The most obnoxious act is the Advertisement found in the front pages of the News Papers in the State published on 11.08.2017 misusing Mahatma Gandhi and Public Funds to fuel anti-Christian hate. Indeed, the Advertisement is erroneous, misleading and inflammatory. The government has used tax payers’ money against tax payers which is a gross violation of democratic ethics and values fundamental to our Constitution. The democratically elected government is expected to safeguard and protect the rights of all citizens irrespective of their affiliations. On the other hand, this government has shown by publishing this Advertisement that it cannot be trusted and stands exposed of its criminal intentions. It is not there to bring about harmony and peace but put one tribal against another. 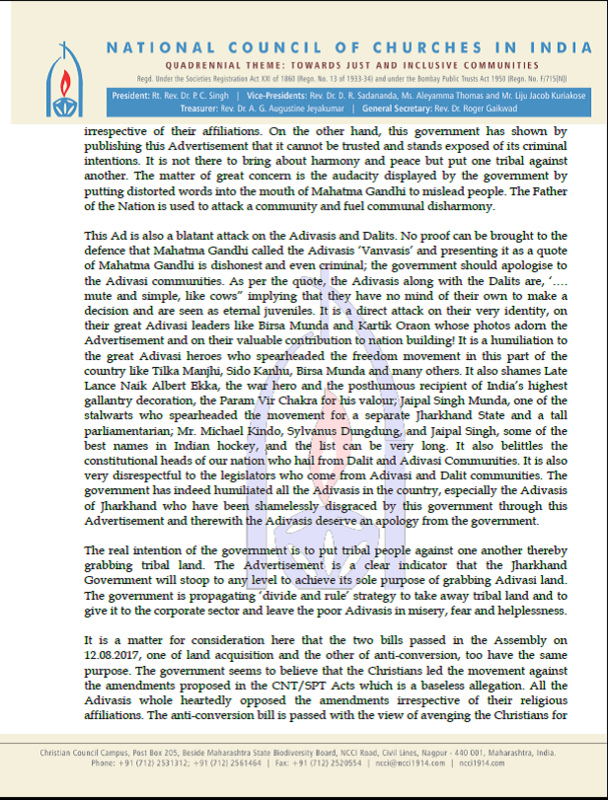 The matter of great concern is the audacity displayed by the government by putting distorted words into the mouth of Mahatma Gandhi to mislead people. The Father of the Nation is used to attack a community and fuel communal disharmony. This Ad is also a blatant attack on the Adivasis and Dalits. No proof can be brought to the defence that Mahatma Gandhi called the Adivasis ‘Vanvasis’ and presenting it as a quote of Mahatma Gandhi is dishonest and even criminal; the government should apologise to the Adivasi communities. As per the quote, the Adivasis along with the Dalits are, ‘…. mute and simple, like cows” implying that they have no mind of their own to make a decision and are seen as eternal juveniles. It is a direct attack on their very identity, on their great Adivasi leaders like Birsa Munda and Kartik Oraon whose photos adorn the Advertisement and on their valuable contribution to nation building! It is a humiliation to the great Adivasi heroes who spearheaded the freedom movement in this part of the country like Tilka Manjhi, Sido Kanhu, Birsa Munda and many others. It also shames Late Lance Naik Albert Ekka, the war hero and the posthumous recipient of India’s highest gallantry decoration, the Param Vir Chakra for his valour; Jaipal Singh Munda, one of the stalwarts who spearheaded the movement for a separate Jharkhand State and a tall parliamentarian; Mr. Michael Kindo, Sylvanus Dungdung, and Jaipal Singh, some of the best names in Indian hockey, and the list can be very long. It also belittles the constitutional heads of our nation who hail from Dalit and Adivasi Communities. It is also very disrespectful to the legislators who come from Adivasi and Dalit communities. The government has indeed humiliated all the Adivasis in the country, especially the Adivasis of Jharkhand who have been shamelessly disgraced by this government through this Advertisement and therewith the Adivasis deserve an apology from the government. The real intention of the government is to put tribal people against one another thereby grabbing tribal land. 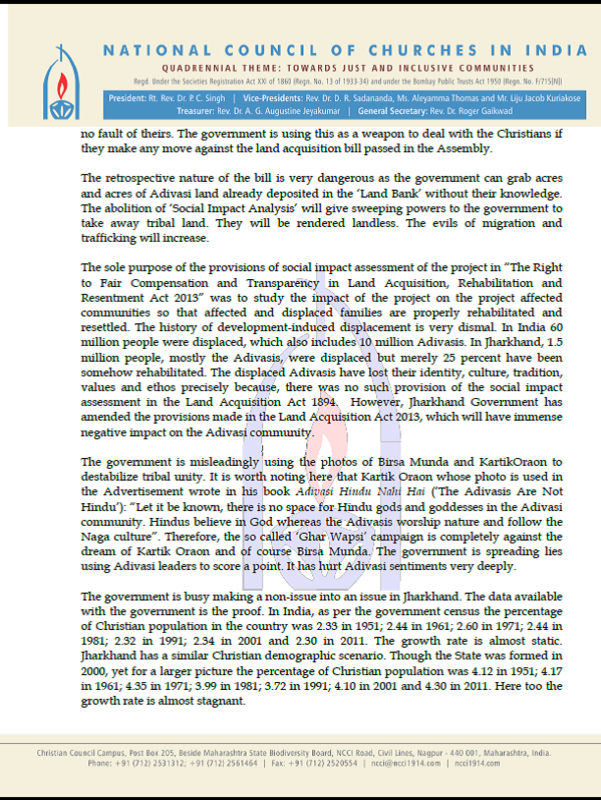 The Advertisement is a clear indicator that the Jharkhand Government will stoop to any level to achieve its sole purpose of grabbing Adivasi land. The government is propagating ‘divide and rule’ strategy to take away tribal land and to give it to the corporate sector and leave the poor Adivasis in misery, fear and helplessness. It is a matter for consideration here that the two bills passed in the Assembly on 12.08.2017, one of land acquisition and the other of anti-conversion, too have the same purpose. The government seems to believe that the Christians led the movement against the amendments proposed in the CNT/SPT Acts which is a baseless allegation. All the Adivasis whole heartedly opposed the amendments irrespective of their religious affiliations. The anti-conversion bill is passed with the view of avenging the Christians for no fault of theirs. The government is using this as a weapon to deal with the Christians if they make any move against the land acquisition bill passed in the Assembly. The retrospective nature of the bill is very dangerous as the government can grab acres and acres of Adivasi land already deposited in the ‘Land Bank’ without their knowledge. The abolition of ‘Social Impact Analysis’ will give sweeping powers to the government to take away tribal land. They will be rendered landless. The evils of migration and trafficking will increase. The sole purpose of the provisions of social impact assessment of the project in “The Right to Fair Compensation and Transparency in Land Acquisition, Rehabilitation and Resentment Act 2013” was to study the impact of the project on the project affected communities so that affected and displaced families are properly rehabilitated and resettled. The history of development-induced displacement is very dismal. In India 60 million people were displaced, which also includes 10 million Adivasis. In Jharkhand, 1.5 million people, mostly the Adivasis, were displaced but merely 25 percent have been somehow rehabilitated. The displaced Adivasis have lost their identity, culture, tradition, values and ethos precisely because, there was no such provision of the social impact assessment in the Land Acquisition Act 1894. However, Jharkhand Government has amended the provisions made in the Land Acquisition Act 2013, which will have immense negative impact on the Adivasi community. The government is misleadingly using the photos of Birsa Munda and KartikOraon to destabilize tribal unity. 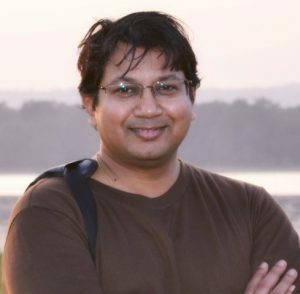 It is worth noting here that Kartik Oraon whose photo is used in the Advertisement wrote in his book Adivasi Hindu Nahi Hai (‘The Adivasis Are Not Hindu’): “Let it be known, there is no space for Hindu gods and goddesses in the Adivasi community. Hindus believe in God whereas the Adivasis worship nature and follow the Naga culture”. Therefore, the so called ‘Ghar Wapsi’ campaign is completely against the dream of Kartik Oraon and of course Birsa Munda. The government is spreading lies using Adivasi leaders to score a point. It has hurt Adivasi sentiments very deeply. The government is busy making a non-issue into an issue in Jharkhand. The data available with the government is the proof. In India, as per the government census the percentage of Christian population in the country was 2.33 in 1951; 2.44 in 1961; 2.60 in 1971; 2.44 in 1981; 2.32 in 1991; 2.34 in 2001 and 2.30 in 2011. The growth rate is almost static. Jharkhand has a similar Christian demographic scenario. Though the State was formed in 2000, yet for a larger picture the percentage of Christian population was 4.12 in 1951; 4.17 in 1961; 4.35 in 1971; 3.99 in 1981; 3.72 in 1991; 4.10 in 2001 and 4.30 in 2011. Here too the growth rate is almost stagnant. A close examination of the tribal population reveals that 14.5% are Christians and 39.7% are Hindus as per the 2011 census. The very sad thing is that a large percentage of Adivasis who have accepted Hindu Religion, or its sanskritized version, have changed, or were forced to change their title to ‘Kumar’ ‘Kumari’ ‘Devi’ and thus have lost their ethnic, social and cultural identity. It is almost a planned murder of the Adivasi community. The government should come out with a law to protect the identity of Adivasi communities if they have genuine concern for them. engaged in divisive activities while it can grab tribal land to pass onto the corporate sector. The government is scared of Adivasi unity and this law is a weapon which will be used to break the unity of the people and give licence to the fringe elements to attack anyone in the name of conversion especially those who dare to oppose the irresponsible policies of the government. Moreover, there is no provision built into the bill to deal with cases of false accusation and misuse of the bill. The intention of the bills is anti-people, anti-constitutional, and anti-peace. The Constitution of India guarantees fundamental right to the freedom of religion under articles 25-28. Therefore, all persons in India are equally entitled to freedom of conscience and the right freely to profess, practise and propagate religion of one’s choice without converting anyone from one religion to another by force, allurement, or threat. The State of Jharkhand should release a white paper presenting the data of such cases of conversion by force, allurement, or threat in Jharkhand in the last 17 years. It is unfair even to think of such anti-conversion law when there are no issues on the ground. Besides, the Indian Penal Code 295 (a) is already very strong to deal with cases of conversion by force, or coercion, or allurement. It has been categorically stated in the Indian Constitution, Article 13(2) that ‘any law made by any legislature or other authority after commencement of the Constitution, which contravenes any of the fundamental rights included in Part III of the Constitution shall, to the extent of the contravention, be declared void. Indeed, the bill is unconstitutional and is a super imposition on the existing law. The bill has no purpose except political and ideological. The timing of the bill clearly reveals that it is politically motivated to break the unity of the Adivasis. The bill proposes to seek permission as well as inform the district collector on matters concerning one’s freedom of conscience which is a fundamental right guaranteed in the Constitution (Art. 25). The choice, or decision to embrace any religion is based on the freedom of conscience of a person and it cannot be dappled with as it is a direct violation of the constitutionally guaranteed fundamental right of freedom of conscience. The question of conversion does not arise here as it is the matter of the freedom of conscience of a person. Therefore, the anti-conversion bill is ultravirus. That these bills are not given assent as their purpose is anti-people and anti-Adivasis. 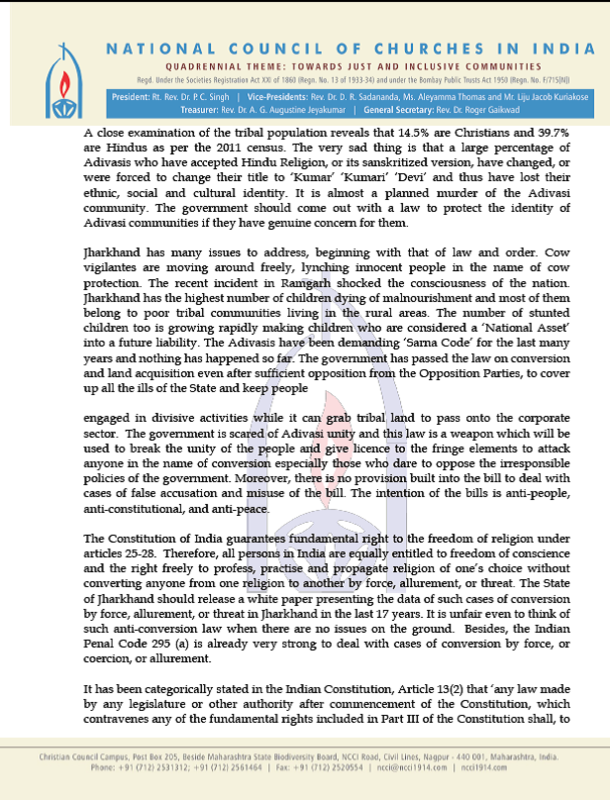 That the fundamental right to freedom of conscience and free profession, practice and propagation of religion, and freedom to manage religious affairs guaranteed under the Article 25 and 26 of the Indian Constitution is protected. That the land of the Adivasis is safeguarded not only for the present but also for the future generations to come. You, as the Constitutional Custodian of the Fifth Schedule Areas of Jharkhand comprising the adivasis of the land, are our hope for upholding justice and secularism in the country.